The port of Riomaggiore (taken form the path leading to the beach). Riomaggiore is among the best bases for exploring the Cinque Terre—conveniently at the southern end of the famous Cinque Terre trail, with several hotels and a trio of excellent rental agencies representing loads of apartments and rental rooms around town. It is bustling but compact, with a single main drag lined with shops, grocers, and restaurants, surrounded by the narrow, stair-stepped streets typical of towns in the region. Exiting the train station (if coming from La Spezia, keep walking in the direction the train was traveling, then head downstairs and and the tracks to get to the station), turn left to head to the Via del Amore and the start of the Cinque Terre trail. Turn right for the modern new park office headquarters and info center (tickets for the park and trails, maps and guidebooks for sale, a cybercafe upstairs). Keep walking past the park info kiosk and through the tunnel beyond to get to the center of Riomaggiore. The main drag, Via C. Colombo, is lined with grocery stores, bars, and restaurants (and, halfway up, a convenient laundromat). Partway up on the left—with a semi-interred entrance under a red-white-and-green sign than says "Cinque Terre Antiche"—is the little Museo della Memoria (Museum of Memory). This consists of a single room with a handful of antique oddments and accoutrements accompanied by lengthy plaques (in Italian and English) describing the local history, customs, and environments (land and sea). Frankly, it wouldn't really be worth the bother if it weren't already free (or, rather, included in Cinque Terre Card you need to access the trails anyway). It's open daily 10am–5pm. At the foot of Via C. Colombo, the tunnel to the right heads back to the train station, while the tunnel to the left turns and heads down and out to the pretty little harborfront marina. Keep walking along this path and around the headland to get to the town's small beach, a slope of smooth, bowling ball–sized rocks at the base of a high wall (where there are two showerheads for rinsing off—a nice touch, and unusual for Italy). Your best bet for finding a room or flat to rent in the Cinque Terre is in Riomaggiore, where there are several fantastic rental agencies, the first two of which below I have used personally in the past with excellent results. Prices varies widely based on size and location (and view—sea views tend to cost more), but expect a room or apartment for two to run about €60 to €120. Cinque Terre Holidays (Via Colombo 94, tel. +39-0187-760-073), about halfway down the main street on the left under a pink-and-white striped awning (though one of the Fazioli brothers, Luciano or Roberto, often meet arriving trains to drum up business); they also run a B&B. Mar Mar (Via Malborghetto 4; tel. +39-0187-920-932; www.5terre-marmar.com), with an office down at the bottom of the main street. Riorooms (Via Colombo 158, tel. +39-0187-920-192; www.riorooms.com), on the main street; reps four apartments. Tourist offices in the Cinque Terre: The Cinque Terre park authority (tel. +39-0187-76-031 or 0187-762-600 or 0187-762-640; www.parconazionale5terre.it) has offices in Riomaggiore at Piazza Rio Finale 26 and at the train station in Manarola. Riomaggiore is on the regional Cinque Terre rail line, passing Manarola (2–3 min. ), Corniglia (6–7 min. ), Vernazza (12 min. ), and Monterosso al Mare (7–20 min.). In the other direction, Riomaggiore is 7–9 min. by train from La Spezia, where you can change for trains throughout Italy (sometimes you change at nearby Sarzana), including Pisa (75–95 min. total), Lucca (1:30–2 hr., with another change at Viareggio), Florence (2:15–3:33 hr., sometimes with another change at Pisa), and Rome (4:17–5:38 hr.). 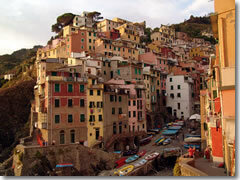 Riomaggiore is my favorite base for the Cinque Terre, so I'd go ahead and look for a place to stay and spend the night. However, as far as the sightseeing in town goes, you can be "done" with Riomaggiore in an hour or two: strolling the main street takes all of five minutes; the little museum maybe 20–30 minutes; hitting the park office for intel another 10–15 minutes. You can lounge on the bouldery beach as long as you'd like.